Do you suffer from knee, hip, or lower back pain? The problem may be in your feet! The WalkFit Platinum Orthotics can help relieve this pain by realigning your spine and pelvic area to help reduce stress on joints. They help distribute your weight evenly to help provide balance and stress. These inserts provide comfort and stability along with advanced shock absorption and odor protection. The WalkFit relieved pain in 90% of users in an independent clinical study! Its new reflexology massage insert helps add additional comfort where you need it most! 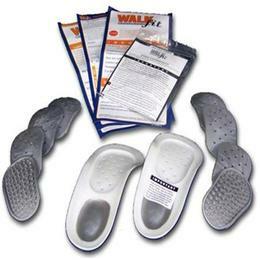 The WalkFit can be worn with most shoes and are easy to insert and remove. You'll want them for every pair! You can wear Walkfits while performing any activity from sitting to running.